In part one of this tutorial I discussed creating a ternary diagram using a simple data frame that contained five hypothetical cases. In this tutorial I will expand on that foundation by creating a more informative ternary diagram using live data. A useful application of this package in social science research is creating a visual display of parliamentary election outcomes. Specifically we can use a ternary graph to examine the distribution of seats in the British House of Commons over a period of time. Since the UK uses a proportional system to allocate seats in the House of Commons there can be a variety of outcomes in any given national election. The UK has a two party dominant system with a number of minor parties that regularly contest elections. As indicated above, a proportional representation method of allocating seats is used so these minor parties are able to gain some representation in the Commons. For readers interested in learning more about political parties in the UK there are a number of resources readily available at various online and other sources. For purposes of this example I have added the popular vote of all minor parties together in the ‘LD+Other’ column, and the number of seats gained in the ‘SeatsOther’ column. 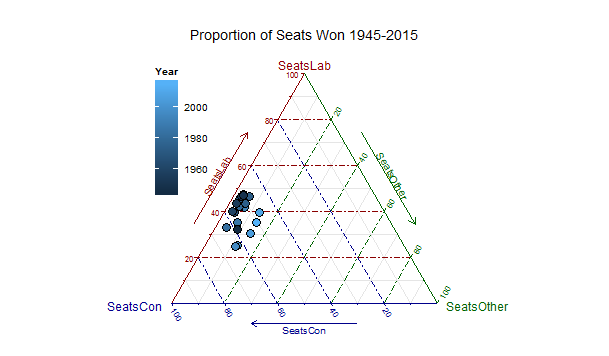 By plotting the three variables ‘SeatsCon’, ‘SeatsLab’, and ‘SeatsOther’ by year on a ternary diagram we can visualize any changes in the mixture of seats won for the three groups. Before working through this tutorial make sure that you have the ggplot, ggplot2, and ggtern packages loaded into your R environment. I originally created the table shown above using Excel and then imported it into R studio for analysis. If you are not using R studio you can enter the data via the R data editor as shown in the previous tutorial, or put the data into an Excel or LibreOffice spreadsheet and import it into R using the read.spss() function that I have discussed in earlier tutorials. You can also use any other method that you are familiar with to get the data into your R environment. Each point on the graph represent the relative division of seats for each of the 19 elections in the table. The shading represents the year with the darkest being 1945 and the lightest 2015. The diagram clearly shows the trend toward more minor party representation and a move away from the two major parties over time. Indeed coalition governments resulted in several of the more recent elections due to the increase in minor party influence. My purpose here is not to discuss UK politics but to show how ternary diagrams can be used in a social science application. With the many additions and extensions that are being added to the ggtern package it can be a very power device for graphical analysis.